Unique and mysterious, fire opals are appropriately named for their fiery cherries, sunburst yellows and deep tangerines. Unlike many other opals, fire opal may not display play of color, and specimens that do are highly valuable. Mexico is one of today's primary fire opal sources, where this fiery gem has been treasured since the time of the Aztecs, who called it "gem of the bird of paradise" in their native language. Fire opals RI is typically between 1.420 to 1.430, but some have been found to be as low as 1.370. Some stones might show play-of-color. 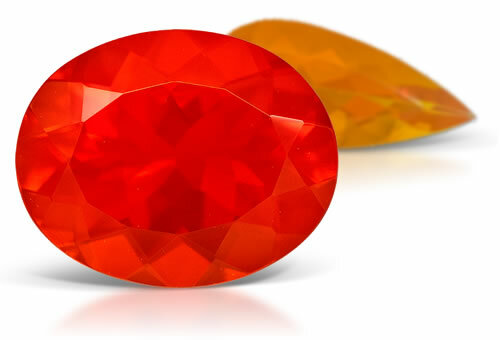 Fire opal might have a cloudy appearance, show color zoning and have mineral or fluid inclusions.